will be on display…Among them is my dad, Jeff Carter. Here’s A treat! Jeff Carter Jr. on guitar with Simon and Garfunkel. Bob Dylan’s decision to record in Nashville in 1966 provided a major catalyst for bringing many others to what must have seemed like a very unlikely destination in the politically polarized sixties. In spite of its reputation as a conservative town, removed from the main trends in popular music, Nashville was home to musicians who had a huge influence on other music scenes of the era. Explore below to learn more about Bob Dylan, Johnny Cash, and session musicians known as the Nashville Cats. McCoy impressed Dylan with his musicianship, and Johnston urged Dylan to record in Nashville, where there were many other skilled musicians. Dylan took Johnston’s advice; he came to Nashville in February1966 to make the recordings that would become Blonde on Blonde. The album is considered one of the great achievements of Dylan’s career and a benchmark of American popular music. The exhibit also looks at the subsequent albums Dylan recorded in Nashville—John Wesley Harding, Nashville Skyline, and portions of Self Portrait. 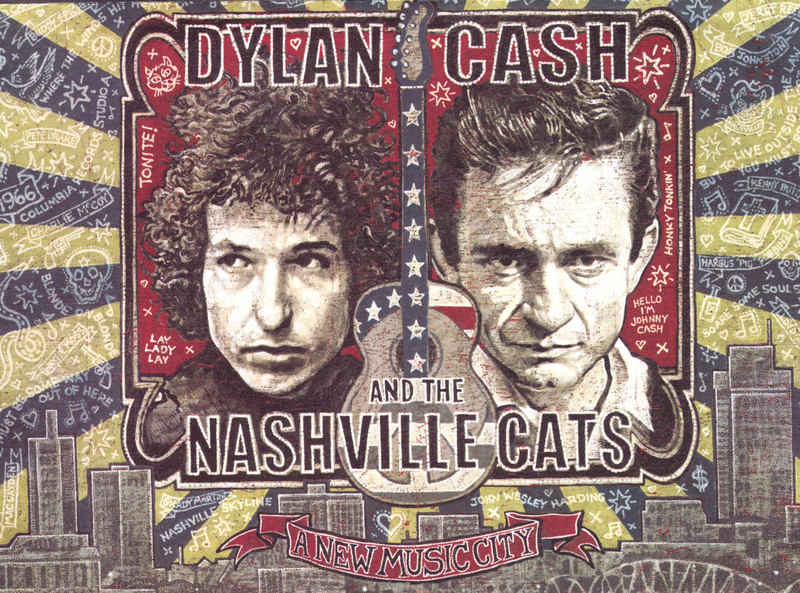 Further, Dylan, Cash, and the Nashville Cats Presented by Citi highlights Dylan’s relationship with Cash. The two cemented their friendship at the 1964 Newport Folk Festival and were reunited in Nashville, in February 1969. Dylan had recorded most of Nashville Skyline when he went into the studio with Cash. They cut more than a dozen duets in two days. One, “Girl from the North Country,” appeared on Nashville Skyline, and Cash wrote Grammy-winning liner notes for the album. A portion of the exhibit will focus on how Cash bridged the cultural gap between Nashville’s old guard and the musical outsiders who came to town in Dylan’s wake. One means for doing so was Cash’s network TV show. The Johnny Cash Show was shot at Nashville’s Ryman Auditorium and became an outlet for country artists and for folk, pop and rock musicians trying to reach new audiences. Dylan and Joni Mitchell were guests on the first show, and Ronstadt, Young, Lightfoot and Eric Clapton’s Derek & the Dominos appeared on subsequent shows. Artists who followed Dylan to Nashville to record or to appear on Cash’s show were rewarded with the opportunity to work with world-class musicians. In several cases, the visiting artists produced albums that ranked as career highlights, thanks to the accomplished Nashville players providing support. One portion of the exhibit takes a look at artists who came from music scenes in New York, San Francisco, Los Angeles, Toronto and London to record with the Nashville Cats. The centerpiece of the exhibit is a series of 16 listening booths, each devoted to a Nashville Cat of the era—David Briggs, Kenny Buttrey, Fred Carter Jr., Charlie Daniels, Pete Drake, Mac Gayden, Lloyd Green, Ben Keith, Grady Martin, Charlie McCoy, Wayne Moss, Weldon Myrick, Norbert Putnam, Jerry Reed, Pig Robbins and Buddy Spicher. Each booth provides biographical information, archival photos and audio samples of the musicians’ signature licks on both rock and country recordings from the late 1960s and early ’70s. Nashville became a new place. The influx of musicians, writers, and artists during this era enlivened the city. The political climate and the countercultural movement provided a supercharged atmosphere for creativity. Nashville songwriters like John Hartford, Kris Kristofferson and Mickey Newbury approached their craft in new ways. Earl Scruggs ended his association with Lester Flatt and formed a band with his sons, to explore a new repertoire. New venues like the Exit/In emerged to showcase music in the new Music City. The exhibit explores this transition.